In 1584, William the Silent was assassinated by a French Catholic, Balthasar Gérard. 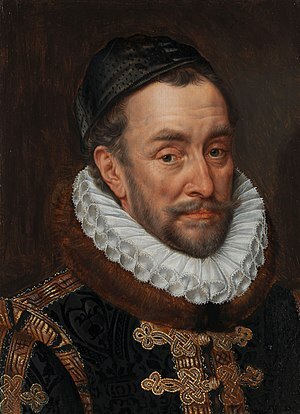 William, Prince of Orange, was the leader of the Dutch revolt against Spanish rule in the Netherlands, and the Spanish king had promised 25,000 crowns to anyone who killed him. William had just finished dinner in his home in Delft when Gérard arrived, on the pretext of delivering a message, pulled out his pistols, and shot him 3 times. Assassination wasn’t new. People have been stabbing, skewering and poisoning their rulers since Suetonius was reporting from Rome, but this death was different. In The Awful End of William the Silent (2005), Lisa Jardine calls it a turning point in European history, the first time a head of state was killed by a handgun (though Wikipedia, which always knows better, points out that the Scottish Regent, the Earl of Moray, was shot dead 13 years earlier).